Ok. I'm doing it. I'm jumping on the Smoothie bowl train. We have been eating these for a year or so now, I just have never gotten around to sharing the recipe! For those who are new to the idea of a smoothie bowl - it's just a slightly thicker smoothie in a bowl, with toppings. And it's the best. Not just because it's an excellent excuse to eat heaps of peanut butter, but it's an awesome way to switch up the breakfast situation if you are getting tired of a regular smoothie. Eating it out of a bowl feels so much more exciting. Maybe that's just me. It's also a really good way of making sure you get a really good nutritious start to your day - you can load up the bowl with berries, seeds and nuts, which I find really help to keep me full. I like going with the same base every time for the bowl, and then switching up the toppings. For this recipe I use greek yogurt. If you were wanting to keep it vegan, sub in an extra half a banana, or use coconut yoghurt. I also tend to use homemade almond milk - you can find a recipe for it here. Feel free to also use any other milk, dairy or non-dairy (almond is just what I have on hand most often). Top this with whatever you would like! I generally top it with lines of coconut, chia, hemp seeds and cacao, and then add in some peanut butter. It is also amazing with granola. For this bowl, I used small cookie cutters to cut out shapes from fruit, which would be perfect for kids (or adults!). 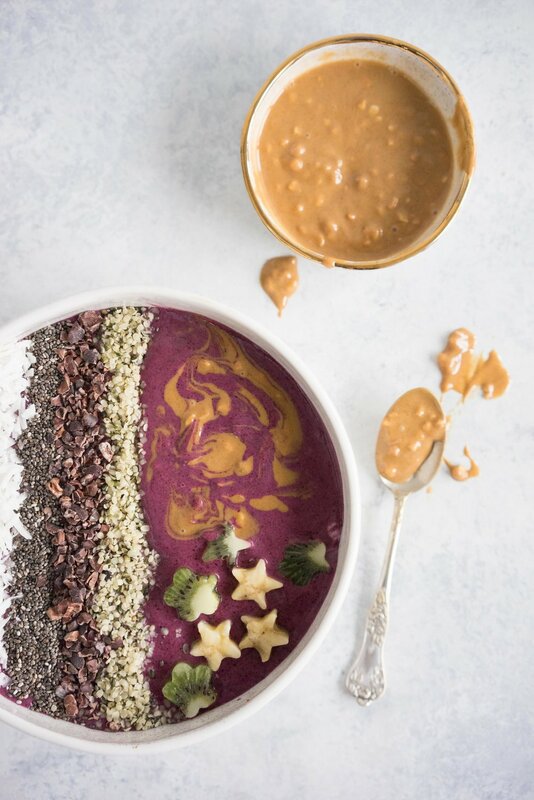 This smoothie bowl in particular is jazzed up with something a little special! I have used Sujon Blackcurrant powder as a little addition. Sujon is a family-run company from my hometown back in New Zealand. Not only is it run by a lovely family, they have some incredible products. I worked there during the summer of my University holidays, packing frozen fruit, and blast freezing boysenberries and blackcurrants during the season. I have been using this powder myself for a few years now, and I love it. It is made by freeze-drying and crushing blackcurrants. Approximately 7kg of berries go into producing 1kg of the powder, which means that all the beneficial properties (antioxidants, flavonoids, all those good things) of blackcurrants are hugely concentrated. It also does AMAZING things for muscle recovery. A teaspoon of powder, either in a smoothie or smoothie bowl, or just stirred into a glass of water, helps hugely with muscle repair and recovery, and the removal of lactic acid via vasodilation of blood cells. And it works. There has been a huge amount of research done on blackcurrants as the next superfood. If you want some hard science, you can check it here and here! I can tell you from personal experience - this stuff is the best. AND they ship internationally for free! Trust me on this one. You want to try this. And so, I would love to share it with you! Sujon is very generously giving away two prize packs - each consisting of a 180g package of powder, and a container of blackcurrant powder capsules, which are a newer product, perfect for those who prefer to take things in pill form. 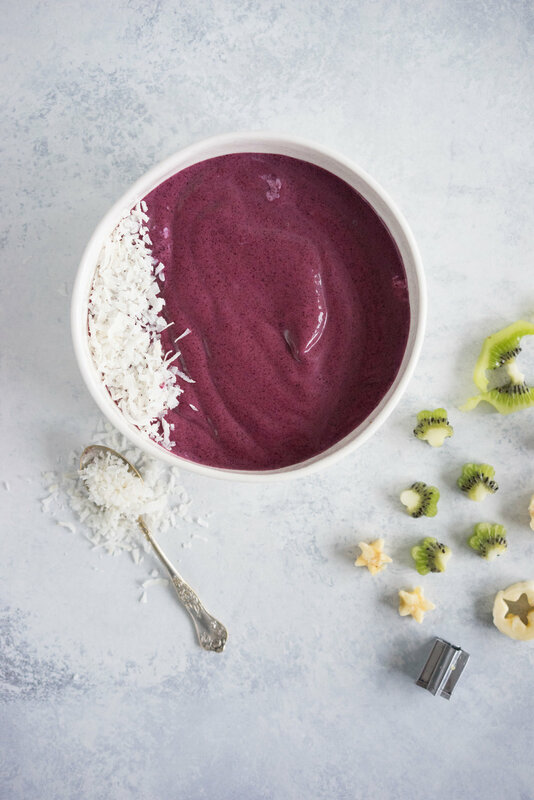 All you have to do is make sure that you are following both myself and Sujon on Instagram, and then leave a comment below telling me your favourite smoothie flavours! Make sure you mention your instagram name in the comment too. Competition is open worldwide, and closes at midnight on Sunday the 9th of April, at midnight Eastern Standard Time. Your choice of toppings - I like chia seed, hemp hearts, cacao nibs, coconut, and peanut butter, but feel free to add whatever you like! Add all of the ingredients, except the toppings, to a high-powered blender. Blend on low, stopping and scraping down the sides as necessary, or using the tamper of your blender if possible. Once the smoothie has begun to combine, increase the speed to medium high, and blend until smooth. Divide the smoothie between serving bowls, and top with desired toppings. Serve immediately. 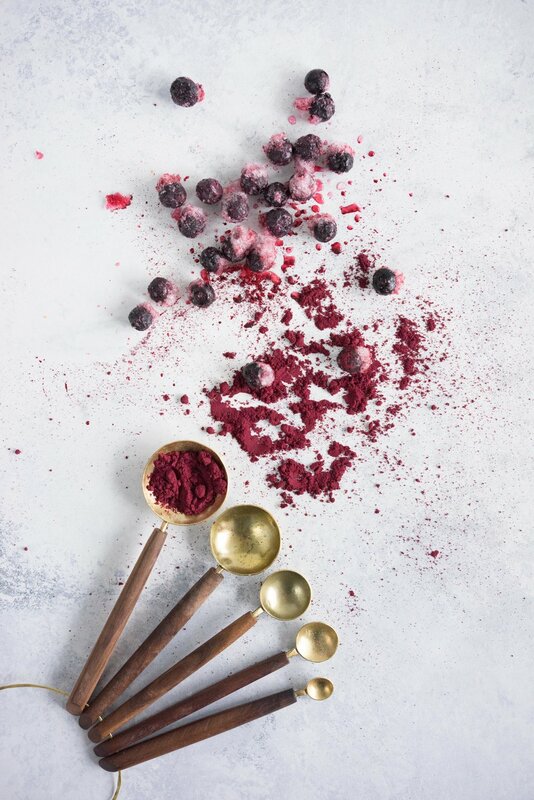 Thank you so much to Sujon Berries for providing the powder used in this recipe! All opinions are my own.